We have grown over the years. We now have three mounted companies and one dismounted company. Headquarters company is located primarily in the Houston area but has members in Hockley, Hempstead, Magnolia, Tomball, Conroe and Livingston. Company A is designated for our dis-mounted company and has troops from all over Texas. Company B is located in Oklahoma and Company C is located in California. We all share the same philosophy about Living History and re-enactment. 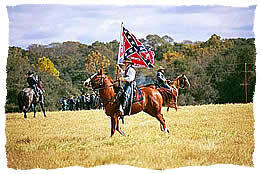 Our primary focus is the accurate portrayal of the cavalry during the Civil War. We participate in battle re-enactments, drills, living history, classroom lectures, parades, encampments and much much more. Our goal is the preservation of the tradition and legacy of the Horse Soldier, primary during the Civil War but with some attention to other periods as well. 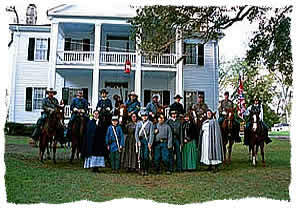 Though the name implies a "Texas Cavalry" emphasis is on the cavalry of the period as our secondary impression is that of the 6th US Cavalry, Company K.
Participating in events and drill, the 3rd Texas Cavalry enjoys the camaraderie of friendship and mutual respect that a "Gentlemans Cavalier" would have enjoyed of the period. We encourage the development of character traits of moral courage, loyalty, honesty and camaraderie. The 3rd is as home fighting and encamped with the Union as it is with the Confederacy at Local, State and National events. Our goal is to accurately depict the life and times of the cavalry. Our encampments strive to be as accurate to history as possible with great attention to details. Safety and respect for ourselves and horses are paramount in our approach to drill and training. With the development of a standard operating procedure each new recruit is shown what is required and expected as the trooper begins to know and come to love this fascinating hobby. We strive to provide the atmosphere which encourages "family participation" and enjoyment. Want To Join Us ?..